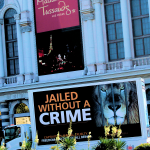 There’s a new mobile billboard truck running down the Las Vegas strip this week, have you seen it? 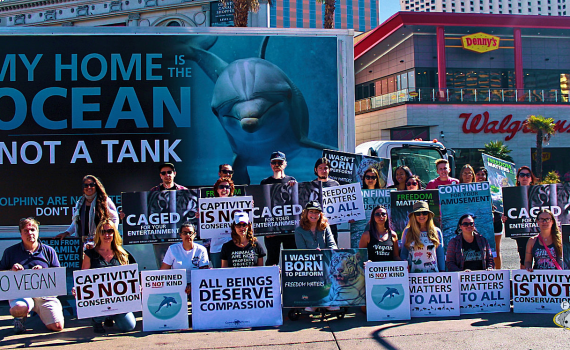 On October 21st 2017, Compassionworks International hosted an event outside of the Mirage Hotel to raise awareness about both the dolphins and the wild cats confined within the Secret Garden attraction. 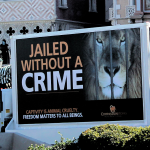 There were other “Freedom Matters” events held around the country: Franklin Park Zoo (Boston, MA), Los Angeles Zoo (Los Angeles, CA), and Brookfield Zoo (Brookfield, IL). 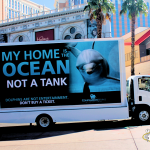 The protest outside of the Mirage Hotel included something special… a mobile billboard truck rolling down the always populated Las Vegas strip for a week of advertising. 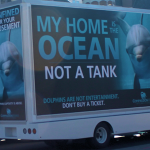 The sides of the truck display messages such as “MY HOME IS IN THE OCEAN”, and “JAILED WITHOUT A CRIME”, “CONFINED FOR YOUR AMUSEMENT”, and “CAPTIVITY IS CRUELTY”. The City of Las Vegas sees an average of over 800,000 tourist visitors a week… that is nearly one million people who have the potential to see the mobile billboard! Let us know if you see it. Click this link to watch our video of the truck in action! 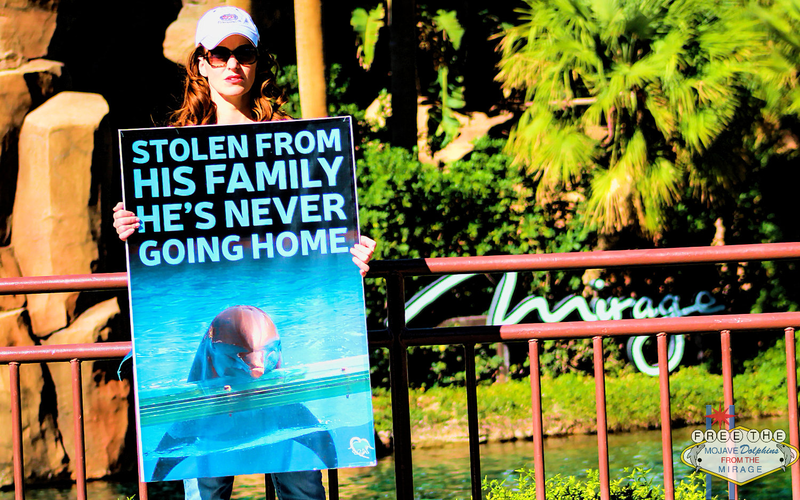 TWEET THIS MESSAGE: I am disgusted that it’s been 27 years and @MGMResortsIntl @TheMirageLV has yet to provide their #MojaveDolphins with a shade structure. 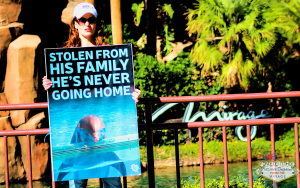 We will continue to document the conditions these animals are held in, raise awareness on how it’s wrong to purchase tickets to view their suffering, and hold events outside of the Mirage Hotel. Our next event will be our 3rd annual “Thanks But No Tanks” protest held the Saturday after Thanksgiving. Thank you to Compassionworks International for the mobile billboard truck.